Top Tier is the best of both worlds—a fun, upbeat dance band and a smooth, light jazz band all in one! So whether you just want a great variety party band, or you also want some relaxing cocktail/dinner music before the party really heats up, look no further! Top Tier has a repertoire that spans over 7 decades and encompasses many styles of music. Whether it be pop, rock, disco, Motown, country, jazz, or oldies, Top Tier can handle it. We’re available for Weddings, Corporate Events, College Functions, Festivals, Class Reunions, Military Balls, Fundraisers, Birthday Bashes, Anniversary Celebrations, Holiday Parties, Outdoor Concerts, and more! Top Tier can be booked as a 5-piece, 6-piece, or 8-piece band, with sax or a complete horn section. 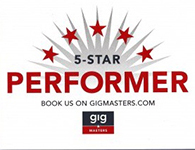 We are consistently annual winners of Wedding Wire’s Couples’ Choice Award and Gigmasters 5 Star Performer Award. The attention to detail that we give each and every event, to make sure it’s the best it can be, is unmatched. Check out our testimonials page for proof of that. Top Tier consists of top notch, experienced Nashville musicians with a passion for performing. Our band members have shared the stage with a diverse group of artists, such as Rick Springfield, The Cars, Craig Morgan, Tiffany, Phil Vassar, Ambrosia, and John Ford Coley. Collectively we have performed everywhere from cruise ships and casinos to arenas and headlining major outdoor concerts. We’ve also written music and recorded with members of Sawyer Brown, Winger, Thompson Square, Giant, and Steve Perry’s band. Our music has been used in major motion pictures, TV, advertising, and recorded by several artists. So when you want the highest level of live entertainment, for an affordable price, be sure to choose Top Tier! Video and Photography by Mazzo Media and Jordan Hunter Photography.